UN personnel are informed and reminded through training and awareness raising campaigns of their responsibility to abide by the highest standards of professionalism, dignity and integrity. Unfortunately, there are allegations of misconduct involving peacekeeping personnel. UN rules define misconduct as failure to comply with obligations under the United Nations Charter, the Staff Regulations and Staff Rules, or other relevant administrative issuances or policy documents developed for specific categories of personnel. 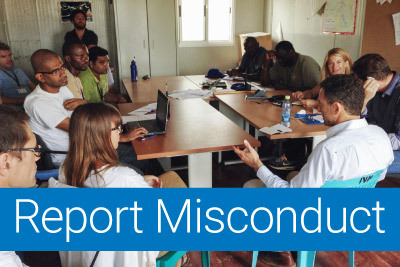 Misconduct can also result from failure to observe the standards of conduct expected of an international civil servant. In response, the UN and Member States ensure that all credible allegations of misconduct are investigated and that appropriate action is taken when allegations are substantiated. Authority for addressing matters of criminal or civil accountability rests with Member States, and the UN will refer such matters to Member States for action.